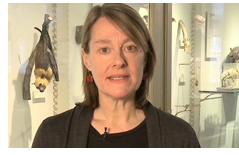 Filled with vivid imagery of animals from around the globe, this new lesson, entitled “Meet the Family: Investigating Primate Relationships,” was created by Jennifer Cross Peterson, Senior Educator at the Harvard University Museum of Natural History. In this lesson, students will see the different types of evidence scientists use to understand evolutionary relationships among organisms—including physical characteristics, fossil remains and DNA sequences. Ms Peterson guides students smoothly from a straightforward examination of physical characteristics through a more complex analysis of amino acid sequences. Watch the lesson here. Did you know that lactase tolerance is a relatively recent adaptation by humans to their environment? In this new lesson created by Julie Boehm, a biology teacher at Wellesley High School in Wellesley, MA, students are introduced to the concepts of evolution—specifically human evolution. They will get to link concepts learned in their DNA, protein synthesis, and genetics units to their understanding of evolution. While creating this lesson entitled “You Can’t Always Get What You Want: A Lesson in Human Evolution,” Ms. Boehm worked with scientists at the Broad Institute of MIT and Harvard, a biomedical and genomic research center located in Cambridge, MA. Watch the lesson here. Visually dazzling in its presentation of the fascinating world of plants, this lesson focuses on the process of pollination and the critical role it plays in maintaining life on Earth. Entitled “Pollination: Saying It with Flowers,” the lesson was created by Naomi Volain, a science teacher at Springfield Central High School in Springfield, MA. Believing strongly that most students don’t have a familiarity with and appreciation of plants, Ms. Volain guides them on an engaging voyage through the remarkable adaptations achieved by plants to insure pollination. Cautioning students away from “Plant Blindness”, she encourages them to visit gardens and greenhouses and to plant their own seeds. Watch the lesson here. MIT BLOSSOMS has recently been featured in two online publications. “Putting Teachers at the Center of Educational Technology” appeared in Slate.com in late June, while “There’s No Good App for Teaching” appeared last week in Ideas.TED.com. We are pleased to announce the arrival of a new lesson, “How to Estimate the Value of Pi” created by Renyong Feng, a math teacher at the Verakin High School in Chongqing, China. Working from previous knowledge, students will try to estimate Pi value using different methods, such as: direct physical measurements; a geometric probability model; and computer technology. Currently this lesson is only available in Mandarin Chinese, but soon there will be an English voice-over version. Watch the lesson here. Highlights for High School is an open educational resource developed by MIT OpenCourseWare that provides free classroom materials for high school educators, students, and parents. The website is organized into two main sections: Subjects and Exam Preparation. The Subjects section is arranged by topics that you are likely to encounter at your high school, such as mathematics, physics, and biology. The Exam Preparation section is aimed at students who are preparing to take Advanced Placement exams in biology, calculus, chemistry or physics. Visit the website here.